Do you like cute rooms? Are small rooms the kind of hangouts you look for? To see more about a room that fits both criteria, click the “read more” button now! 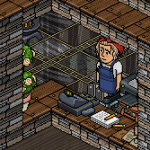 Rooms on Habbo are very important as they are the places you make or play games, hangouts, and even coin shops! Some of the rooms we barely even see. Sometimes we struggle to find a nice room to relax in, but don’t worry for I have found a lovely room that you should hang out in! Behold Saira’s Bakery by :Society! Oh my goodness! Isn’t this room just adorable? When I saw this room, I instantly thought “I need to write an article on this!” I like the chimney at the top of the building as it really adds to the bakery look. The windows fit in with the bricks perfectly. I love the sun shining down on us! Isn’t that waterfall pretty? Ooh, look at that fishing gnome! When you walk into the room you will see a fantastic entrance with beautiful decorations. My favourite feature of the entrance is the St. Bernard dog! I think this is an awesome feature of the bakery! All the lovely pastries and cakes are colourful and they look scrumptious. 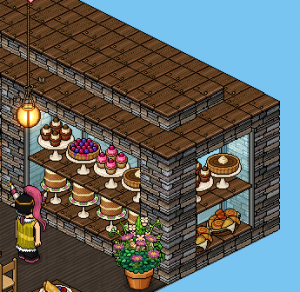 It’s a shame that you can’t use the baked furni to get a slice out of them, but that’s not :Society’s fault. Hey, can I have a chocolate cupcake please? Now this is the area where we buy and eat our food! I like the plants in the room because they add colour. I also like how some tables have two seats and others have one seat as some Habbos may prefer to sit on their own. There’s also a bot sitting at the till so go and buy your treats, Habbos! Want to go to this room? Click here now! Do you like the look of this room? Have you been there? Let me know what you think of this room in the comments section below! Check out Habbox.com for the radio, articles and more! Go to Habboxforum for the latest discussions and competitions – sign up now!